The DEM 738 bottle labeller is designed for high output on a small footprint. A transfer wheel separates the bottles and passes them onto the labelling star wheel. 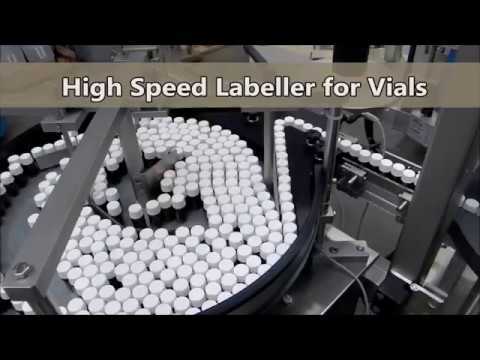 The Herma label applicator applies the labels in continuous motion. In standard execution the labeller stops to allow the operator to remove the defective bottle manually. The DEM 738 labeller can operate at 200 or 400 bottles per minute. The labeller can be fitted with a printer and camera to verify the print. Label application can be verified using a luminescence sensor. Changeover is simple. Re-feed the label reel and exchange the star wheels and guides. Choose the format from the HMI and start labelling. Our portfolio of bottle labelling machines does not end here. For Outputs up to 250 bottles per minute our HSL 250 universal labeller is format free. For small areas we can offer our compact Monoblock filler, capper and labeller at the speed of 50 bottles per minute. Despite its small footprint (around 2 square metres of space), it is a complete line. If needed, an integrated checkweighing option is available for tablet counting or liquid filling projects. Here the designers also paid attention to reduce the time of changeover, only a single starwheel and a number of guides are needed to be changed for a different bottle size.